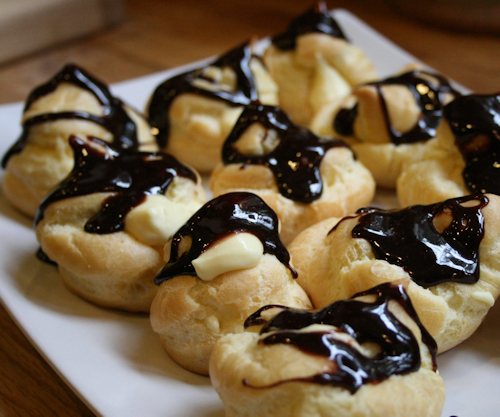 Being from New Jersey, I feel eclairs are their own food group along with pasta and almond rings(Next on my list!). 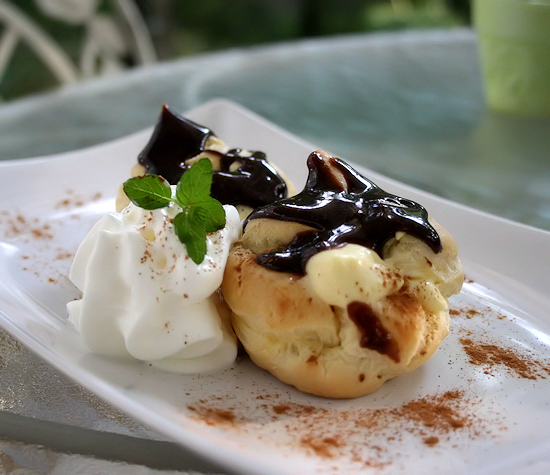 Being that there is no bakery here in Murphy that makes genuine Northern eclairs or cream puffs, I have taken this offense as a personal challenge. 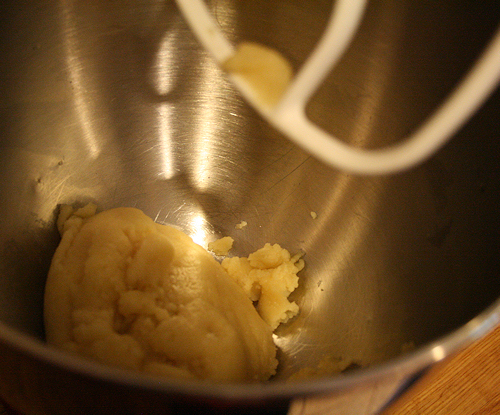 Let me tell you… the first attempt at the dough was a FLOP!! I could toss it in the yard like a frisbee as I thought this has to be wrong and added more flour!! Well… Silly me did not follow Nonna’s recipe correctly and to the letter. Shame on me!! But the second attempt was a success! 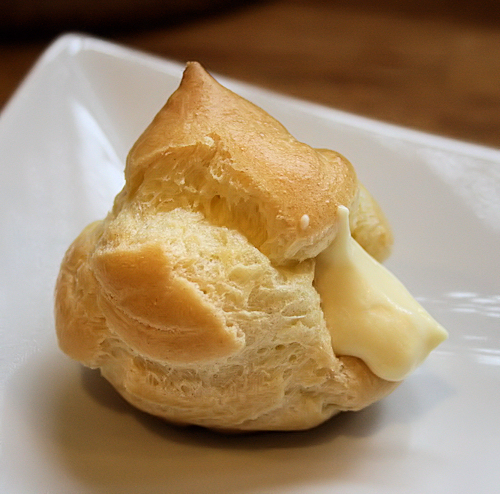 They were light and fluffy and the cream was perfection. I took one shortcut and that was the chocolate cream which I am so glad I did as I do not think I could have duplicated the sheer delight that was this topping! You will need: Preheat oven to 425 degrees. First thing I do is make my filling so I can get it into the fridge and nice and cold. 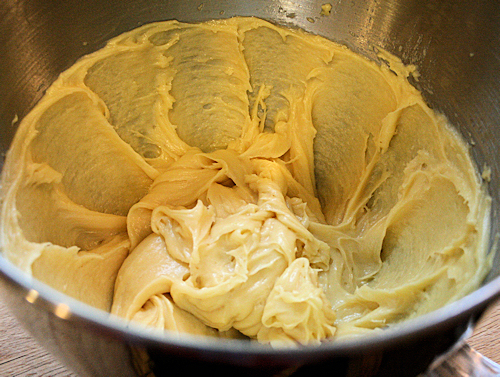 So take your instant vanilla pudding and put in a bowl adding the milk and whisk until it starts to get thick. 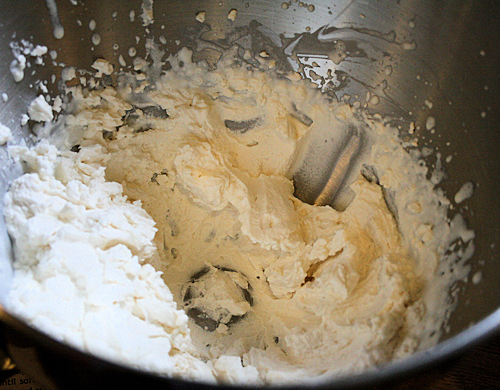 Take your whipping cream and pour into a mixing bowl and with a hand mixer or standing mixer, beat in the the powdered sugar, vanilla and salt. 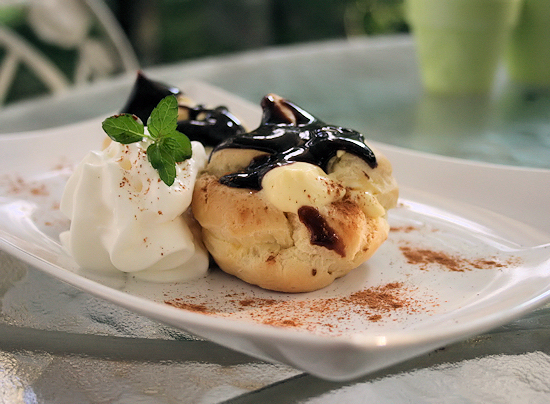 You will see nice soft peaks forming and you have whip cream! Don’t skip the salt, it gives it a nice little kick kind of like salt on caramel does. 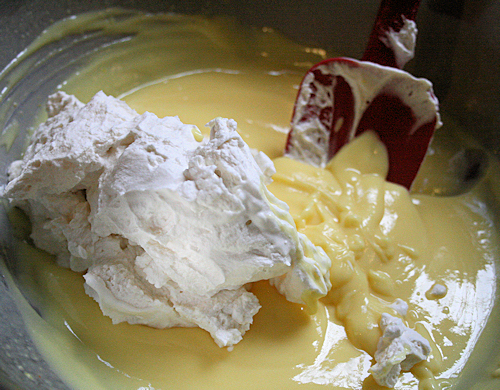 Take the whip cream and fold into your pudding mixture then set aside in the fridge. 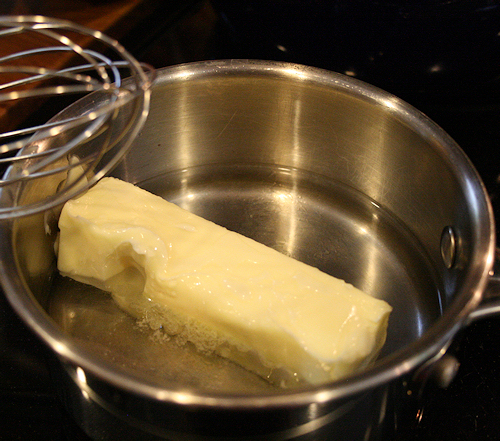 In a medium sized pot, add the butter and water and bring it to a boil. 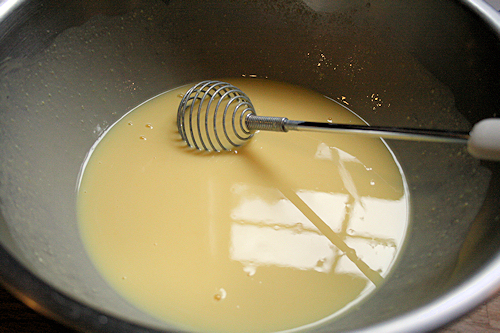 As soon as the water and butter boils, reduce the heat and add the flour, stirring quickly with a wooden spoon. It will start to form a dough ball. That’s good, that is exactly what you want. This dough is so easy. 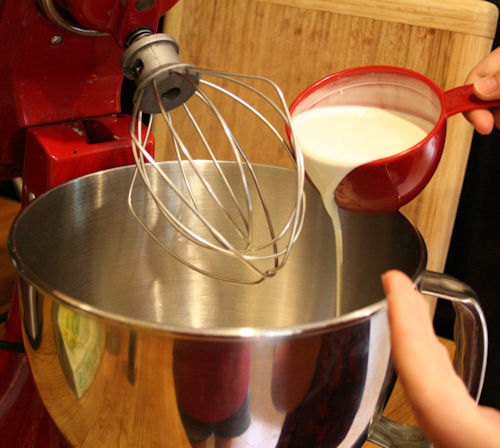 When the ball is firm and not wet, take it off the heat and put directly into your mixing bowl. 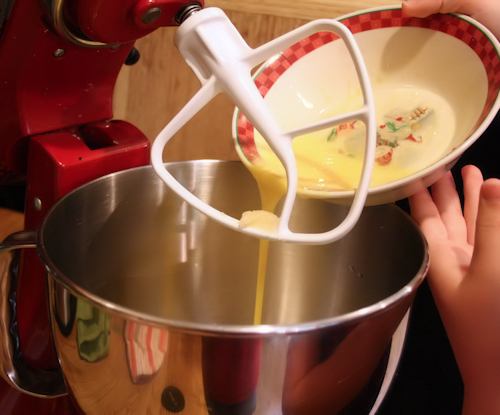 Use your paddle attachment if you are using a stand mixer. 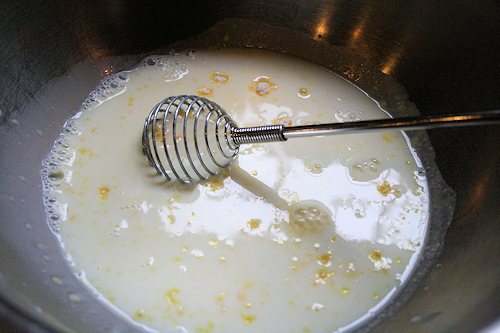 Pour in the eggs and whisk on medium high to get the eggs mixed in quickly. 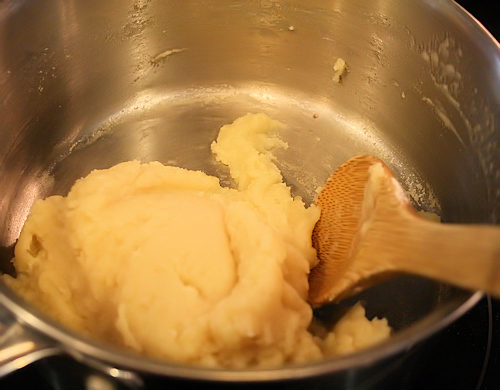 Note: You can also do this by hand, but you must work very quickly like you did with the dough in the pot. 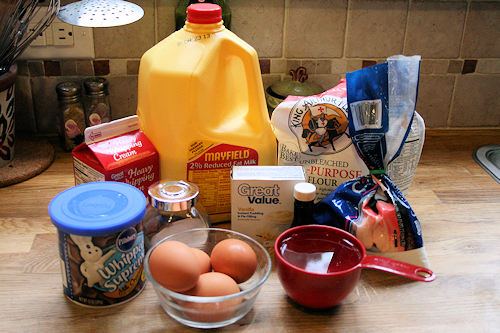 Mix one egg in at a time ensuring the eggs do not cook and stir constantly until it is mixed through the dough. 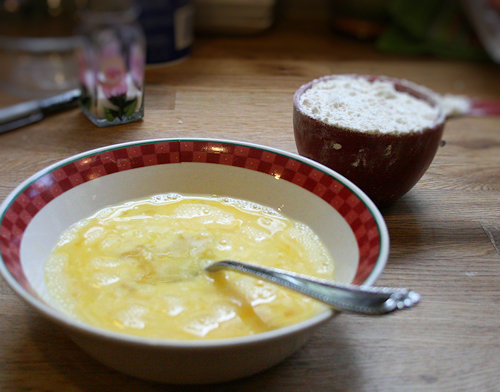 When the eggs are incorporated, the dough will become very shiny and slippery but still remain kind of gooey and thick. 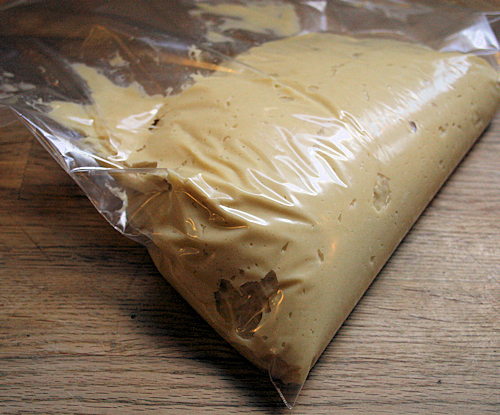 Put the dough into a pastry bag or a large strong zip lock and snip off the end, about 1/4 of inch your don’t want a tiny hole, but you don’t want it too large either. 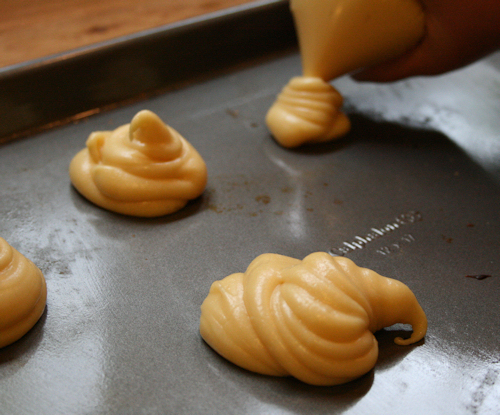 Squeeze the dough into the corner of the bag and pipe it onto a baking sheet into little puffs. Do not place them too close together. Don’t they look pretty? Like little clouds. Wet your finger and knock the little tips flat so they don’t burn in the oven. Bake at 425F for 10 minutes then turn the oven down to 350F and bake for an additional 20 minutes. 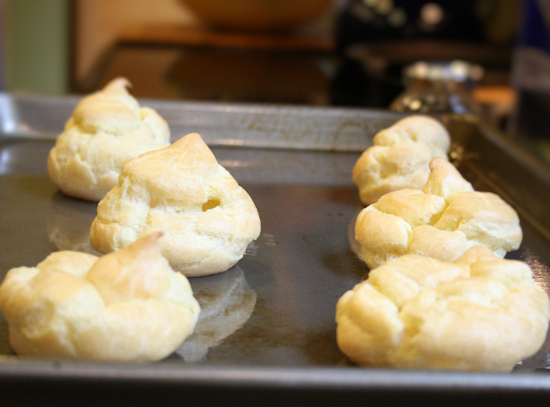 If you have larger puffs, they may need to be cooked a little longer. Mine were about the size of a tennis ball maybe a little smaller. 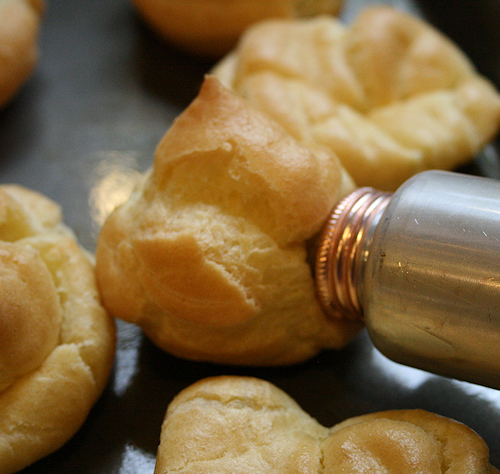 Take the puffs out of the oven and let them cool for at least 20 minutes. 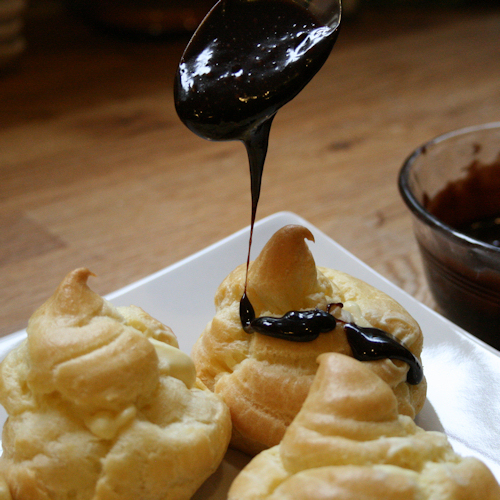 You do not want to put cold pudding into the hot puff or you will have a mess. 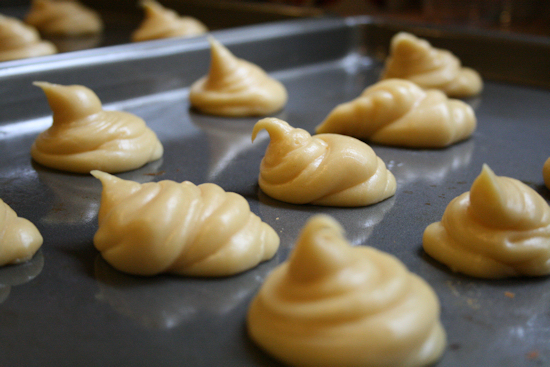 When the puffs have cooled you can do the filling one of two ways. 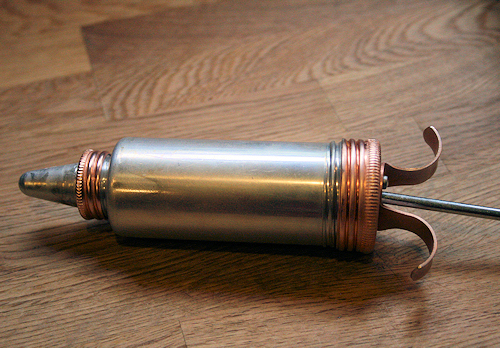 I happen to have purchased a pastry filler on eBay just like my grandma used to use. 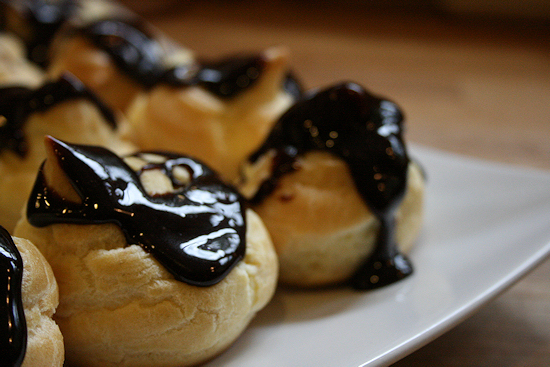 If you don’t have one, you can simply slice the top and dollop the filling in. 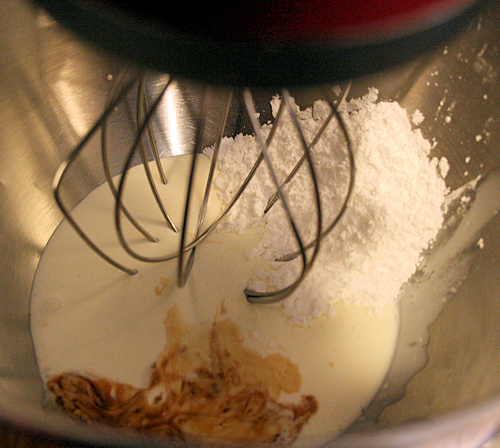 If you have a pastry filler , fill and inject right into the pastry. Look at that! In no time, you are done with the filling. They look amazing enough to eat right now! But c’mon we know everything is better with chocolate, don’t we? Now for the topping. 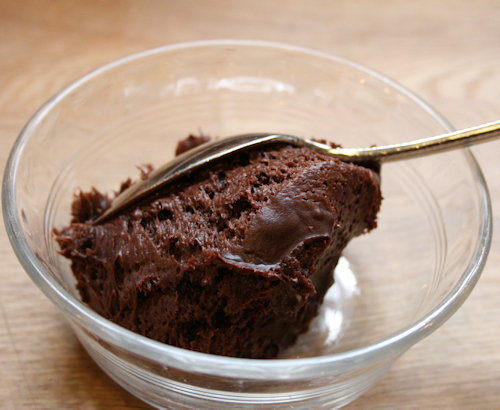 Take a few heaping tablespoons of the icing and place into a small bowl. 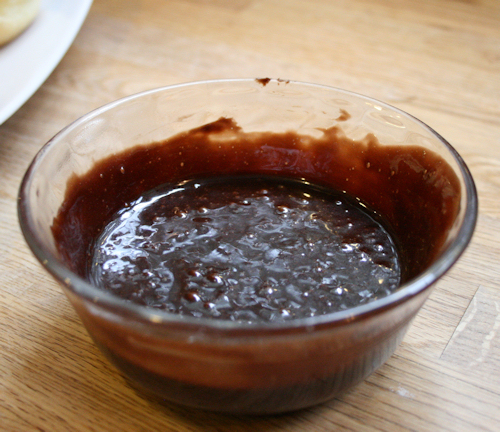 Take the bowl and microwave on high for about 20 seconds until melted and bubbly. You must listen to me on this and use the whipped variety. The consistency is so much nicer. I promise, this is delicious. 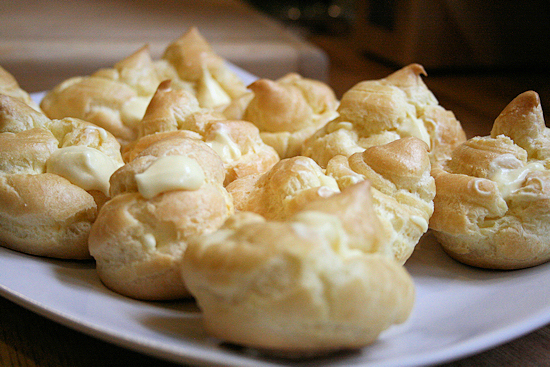 Wait a few minutes to let it cool and drizzle on each puff. Heaven, let me tell you. You will not want to share. Who says you have to? Run away with the plate right now! RUN! So simple, but I assure you they will think you baked all day.